I have actually been given this award twice now.. Once from the lovely Tierney at Tier's Thoughts and by Li Lian at nails nails nails.. I figured I should actually acknowledge these awards so I don't look like a chump!! Here is the problem when I get tagged/awarded/etc, I never know exactly who to send it off to as any blog that I include in my blog roll is a blog I love. I have stumbled across many a-blogs and just exited the page after reading a few entries, only because I am not really interested. 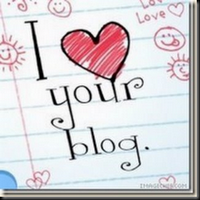 So, to all of the lovely people that I follow, I love your blog!! I read all new entries (I apologize, I am not the best commenter :\), but I try! Thank you all for doing what you do, I appreciate it.